Q? Even though our family’s reunion isn’t until next summer, I’m already worried not have enough people will attend to meet our commitment to the hotel. I was very cautious when I gave the hotel our estimated numbers, but I don’t want to have to pay for empty rooms. What can we do to make sure everyone comes to our reunion? A! There are really many things you can do to help build attendance and the best time to start doing them is NOW … not two weeks before the reunion. Start with your invitation list. Do you have everyone’s name, address and email? Do you have any “distant” relatives you haven’t talked with in years who might be interested in coming? Add them to the list. Facebook and the internet are great tools for tracking down “lost” members of the flock. Different people absorb information in different ways. You’ll want to send out at least one “save the date” mailing (do this right away!) and at least one formal invitation/ announcement, both should be sent via US Mail. Your reunion committee members can help prepare the invitations and get them to the Post Office. Older family members, in particular, like to receive “formal” invitations in the mail. Then, as your reunion date draws closer, you’ll want to send a steady stream of updates via a variety of media … email, personal phone calls, facebook updates, etc. A good rule of thumb is that the communications from the reunion committee throughout the year should unfold just as a good story unfolds. First, you get folks to “save the date” on their calendars. Then, you provide basic details they’ll need in the invitation (when, where, what, how much, etc.). Then, in ongoing updates, you fill in the details. One update might talk about be a special activity you’re planning. Another might be a call for talent show participation. Another might be a “Just for the kids!” update. Then … (and this is very important) … set a date by which folks must send in a deposit to be included in the festivities. It doesn’t have to be a huge amount … even $20 or $25 a person is enough to get people to “commit” to attending. It’s easy for folks to say they’re going to come, but it’s far more meaningful if they have to take out their checkbooks and write a check. People are far less likely to cancel at the last minute or to find excuses for not coming if they have pre-paid a deposit to attend. Offer incentives for early registration (or registration by the deadline). This could include discounted registration for those registering early; $100 per person if you register by January 1st; $125 if you register afterwards. Or offer some incentive like reunion t- shirts at half price if you register by the deadline. In addition to helping ensure that folks will attend, collecting deposits from your attendees will also provide you with the cash you’ll need to make the advance deposits that are typically required by catering companies, motorcoach operators, picnic pavilions, etc. 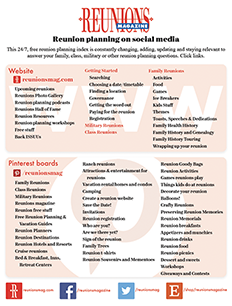 If your family meets regularly, offer a “special incentive” to folks who haven’t attended the last few reunions … or ever! This could be anything at all … a seat at the head table at your dinner, or an upgraded room at the hotel. Use your imagination here! In your ongoing communications, include a list of who has already committed to attend. This will make those who haven’t yet “made up their minds” see that they’re missing out on the fun, and encourage them to register. Point out unique elements of your reunion that folks will miss, if they don’t attend. Having a picnic in the park isn’t unique, but taking a tour of The White House or some other “one of a kind” attraction is. emails, or other communications. These folks will need to be personally called and encouraged to attend. This may take several phone calls, from several family members, but this can be a very effective technique. There are those who need to know their presence at the reunion is desired. And there are those who simply won’t commit to anything unless they’ve been asked to participate personally, and asked more than once! In short, you’ll want to communicate with all of your potential attendees early and often, via multiple avenues, with special “follow-up” attention directed toward those who you haven’t heard from. If you do all of these things, you should be able to look forward to a very well-attended reunion! Previous ArticleWhat if the hotel ownership changes?